While in the final science orbit, TESS, like anybody in a three-body system with little station keeping, goes through Kozai cycles. 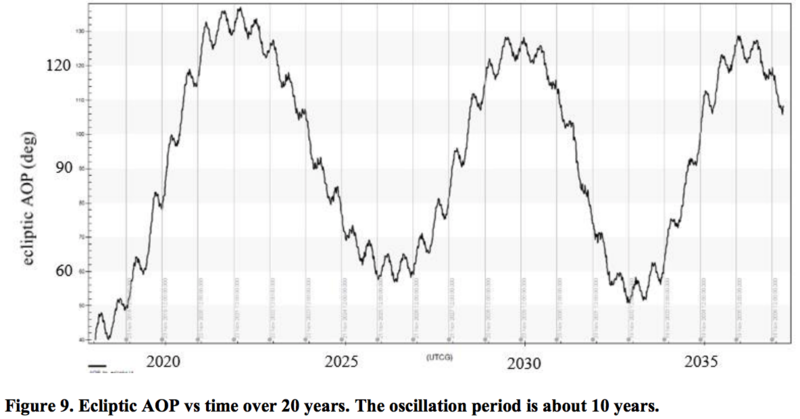 TESS will primarily undergo tho periodic oscillations, one on a 10 month cycle, and another with a 10 year cycle. So, what does this mean? Well, the orbital period is not constant, neither is the inclination, eccentricity or any of the other orbital parameters. The orbital period ranges from about 12.8 to 14.6 days, with an average of 13.65 days. Furthermore, between now and 2020, the perigee distance will range from about 10 to 20 earth-radii. The figure below nicely illustrates Kozai cycles influencing the argument of perigee.